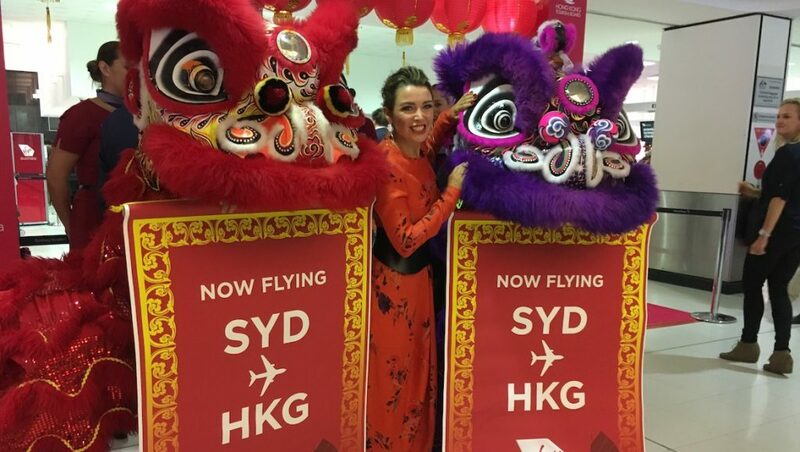 Virgin Australia has commenced nonstop flights from Sydney to Hong Kong as part of its ongoing expansion into North Asia. The inaugural flight VA83 took off from Sydney Airport’s Runway 16L a little after 1000 local time on Monday. It was due to land at Hong Kong’s Chek Lap Kok Airport about nine and a half hours later at 1740 local time. 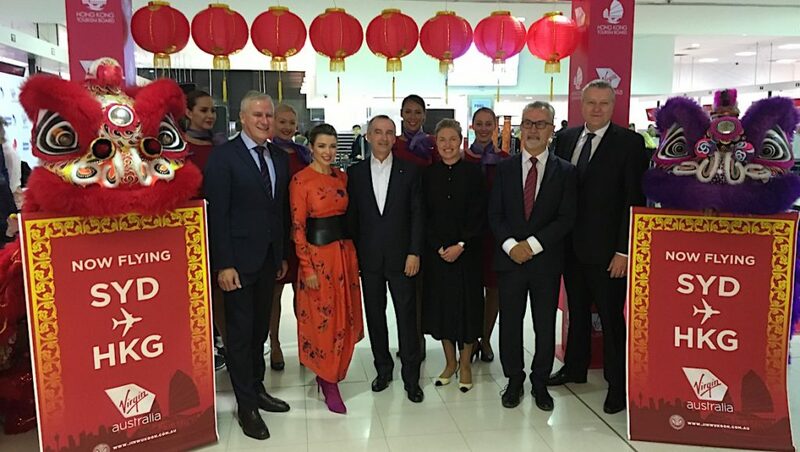 On board the the Airbus A330-200 VH-XFJ operating the VA83 were Virgin Australia chief executive John Borghetti, Deputy Prime Minister Michael McCormack, performer Dannii Minogue, along with airline executives, invited guests and media. It is Virgin Australia’s second nonstop route to Hong Kong, having started flights from Melbourne to the Special Administrative Region in July 2017. 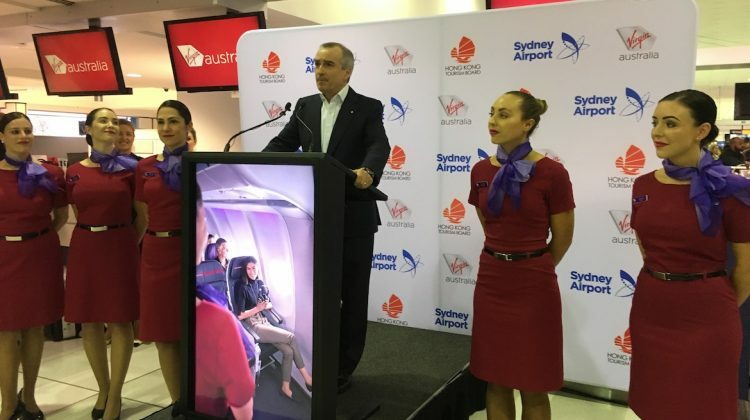 Borghetti said the Melbourne flights have “performed particularly well”, while bookings for the Sydney service had been strong. “They’ve exceeded expectations in both cases,” Borghetti told reporters at checkin row F in the Sydney Airport international terminal prior to boarding the inaugural flight. “We always knew that Sydney was going to be a quick take up and it was, but the interesting twist to it is also the amount of sales that is happening at the other end of the route. Both Virgin Australia’s Melbourne-Hong Kong and Sydney-Hong Kong flights are operated as part of an alliance with HNA Group carrier Hong Kong Airlines, which adds its HX airline code on the two services. There is also a reciprocal frequent flyer agreement with four HNA Group carriers – Hong Kong Airlines, Hainan Airlines, Capital Airlines and Tianjin Airlines – that offers points and status earning, as well as redemption opportunities on eligible flights and lounge access. Further, the tie-up which received Australian Competition and Consumer Commission (ACCC) approval in 2017 enables Virgin Australia to sell connections beyond Hong Kong to 17 points in mainland China via interline connections on either Hong Kong Airlines or Hainan Airlines. Bilateral restrictions prevent codesharing between Hong Kong and mainland China. 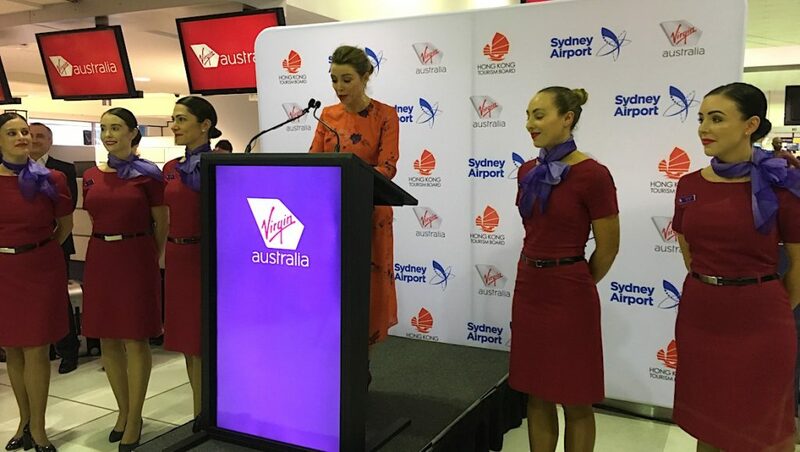 The Australian carrier also codeshares on UK-based Virgin Atlantic’s Hong Kong-London flight. 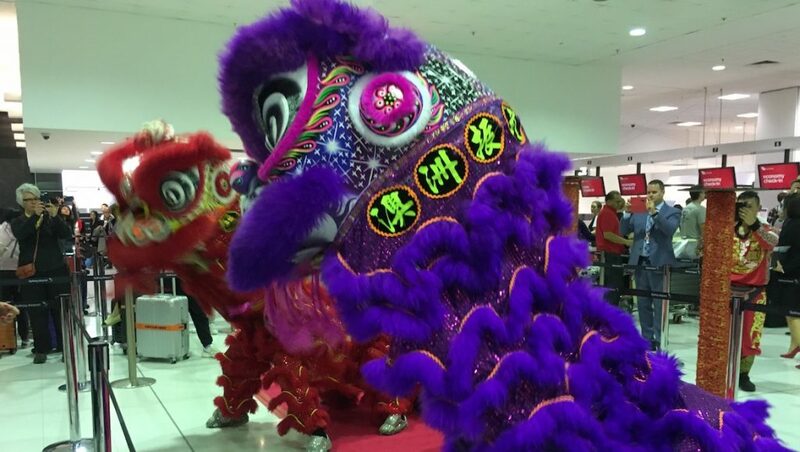 Virgin Australia’s daily Sydney-Hong Kong service is scheduled as a morning departure from Sydney and an overnight flight from Hong Kong. 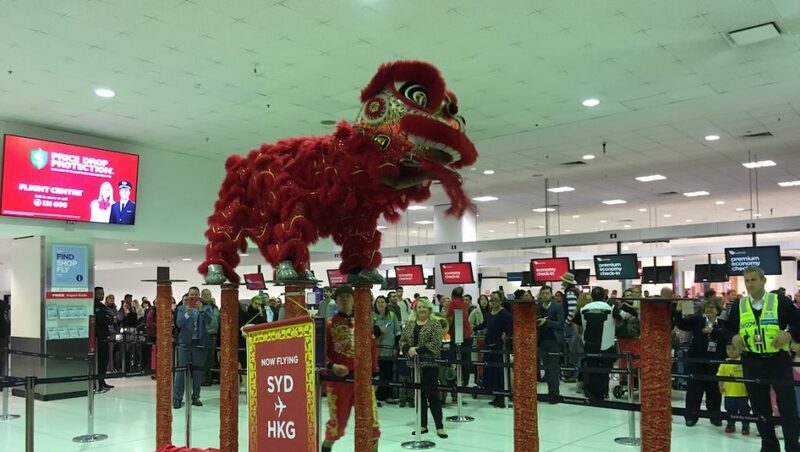 Currently, its flights between Melbourne and Hong Kong operate five times a week as a red-eye service in both directions. Virgin Australia’s efforts to expand its international network to North Asia also includes plans to eventually operate its own aircraft to mainland China. However, the airline’s ambition is, for now, tempered by the reality that China’s major centres such as Beijing, Guangzhou or Shanghai, are difficult to access due to the limited number of takeoff and landing slots available. “There’s a certain degree of the element of what’s possible,” was how Borghetti described the evolution of Virgin Australia’s North Asian expansion. “Slots are quite constrained in not just China but also Hong Kong and it’s a question of where we can access those slots sooner. “Obviously our intention is still to fly to China and we will but it’s a question of timing and a question of access to airport slots. In June, Virgin Australia announced it would add its VA airline code on Hainan Airlines’ flights from Sydney to Changsha, Haikou and Xi’an, Melbourne to Changsha and Xi’an, and from Brisbane and Cairns to Shenzhen. 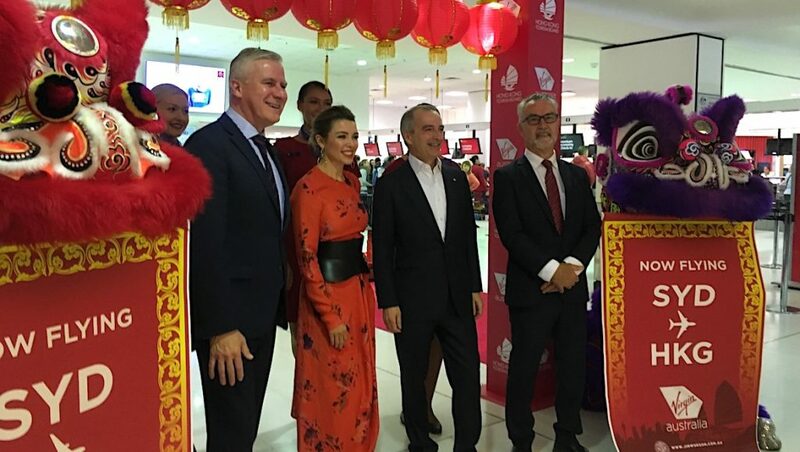 The launch of Virgin Australia’s daily Sydney-Hong Kong offering breaks the oneworld stranglehold on the route that up until Monday had been served by just Cathay Pacific and Qantas. Hong Kong-based Cathay flies up to 70 flights a week to six Australian destinations – Adelaide, Brisbane, Cairns, Melbourne, Perth and Sydney – while Qantas has up to 28 flights a week from Brisbane, Melbourne and Sydney. On Sydney-Hong Kong, Cathay is up to four times daily in peak times, while Qantas offers a twice daily service. And the pair’s flights between Australia and Hong Kong are quite full. Figures from the Bureau of Infrastructure, Transport and Regional Economics (BITRE) showed that in calendar 2017, Cathay Pacific had an average load factor of 84.2 per cent for its flights to Australia and 85.4 per cent for its outbound services. For Qantas, the figures were 79.9 per cent inbound and 78.2 per cent outbound. The BITRE figures showed Virgin Australia’s Melbourne-Hong Kong flights had an inbound load factor of 64.7 per cent and an outbound load factor of 70.5 per cent between July 2017 (when the flights began) and December 2017. The high load factors on Cathay Pacific and Qantas indicate there is scope for a third player in the market. And for now the only airline able to take up the challenge in the Australia-Hong Kong market with its own aircraft is Virgin Australia. That’s because while Virgin Australia is able to, slots pending, move forward on its expansion plans to increase its Hong Kong network under the current air services agreement, the same cannot be said of Hong Kong-based carriers. The bilateral air services agreement is maxed out on the Hong Kong side, with all available capacity to the four major Australian gateways of Brisbane, Melbourne, Perth and Sydney being utilised by Cathay Pacific. Hong Kong Airlines launched flights to Cairns and the Gold Coast in 2016. However, in June the airline announced it would end its three-times-a-week Hong Kong-Cairns-Gold Coast-Hong Kong service with Airbus A330 equipment due to what Cairns Airport described as the airline’s “changing business strategy in the Australian market”. Meanwhile, Cathay Pacific chief executive Rupert Hogg told a CAPA – Centre for Aviation conference in Sydney in early June that with the Australia-Hong Kong air services agreement full on the Hong Kong side, his airline was focused on continuing to upgauge its services between Australia and Hong Kong with larger aircraft, with Airbus A350-900s and Boeing 777-300ERs replacing Airbus A330-300s. “The strategy that we are adopting in order to bring more people to Australia and service the Australian market is really to upgauge,” Hogg said. The introduction of Hong Kong as a second long-haul hub served with widebody A330-200s has implications for Virgin Australia’s domestic operations. 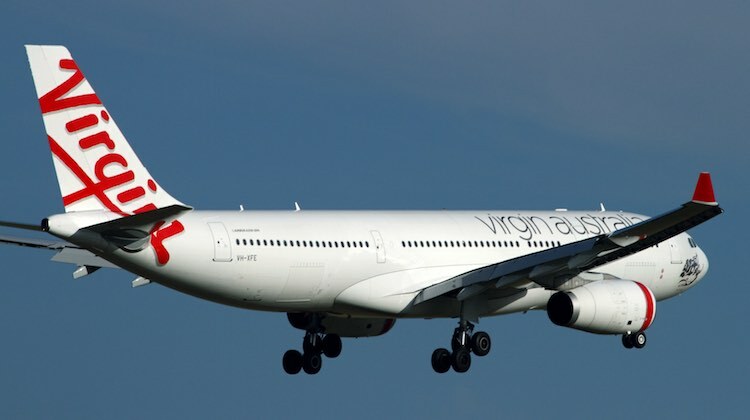 The A330-200s were brought into Virgin Australia in 2011 as the airline formerly known as Virgin Blue introduced a new business class product and widebody service on transcontinental routes between Perth and Australia’s east coast capitals. Currently, the airline has six A330-200s featuring 20 lie-flat business class seats with direct aisle access – dubbed The Business – and 255 economy class seats in a 2-4-2 configuration. The aircraft is the perfect vehicle for flights between Australia and Asia, as evidenced by the extensive use of the type by carriers throughout the region for their services to this country including Cathay Pacific, Singapore Airlines, Malaysia Airlines and a host of Chinese flag carriers. With no outstanding orders for widebody aircraft and with the five Boeing 777-300ERs fully utilised serving Los Angeles from Brisbane, Melbourne and Sydney, the A330-200 looms as the most likely type to serve Hong Kong and inevitably mainland China in the period ahead. The commencement of Sydney-Hong Kong means two of Virgin Australia’s six A330-200s are committed to Hong Kong, leaving four of the type for the Perth market. There have been suggestions that with the A330-200s being deployed on international flying Virgin Australia would develop a sub-fleet of Boeing 737s with similarly appointed business class cabins to serve Perth from the Australian east coast, especially given it has orders for 737 MAXes. Virgin Australia group executive for airlines Rob Sharp said in March the configuration of the MAX cabin, or layout of passenger accomodations (LOPA), was currently being worked through. “The reality is that if we want to deploy A330 aircraft internationally, then clearly we will be looking at product east coast-west coast and newer aircraft would form part of that equation,” Sharp told delegates at the Routes Asia 2018 conference in Brisbane. “We are not at a point where that decision needs to be made. However, we have plans there if we want to action something quicker into the international arena. 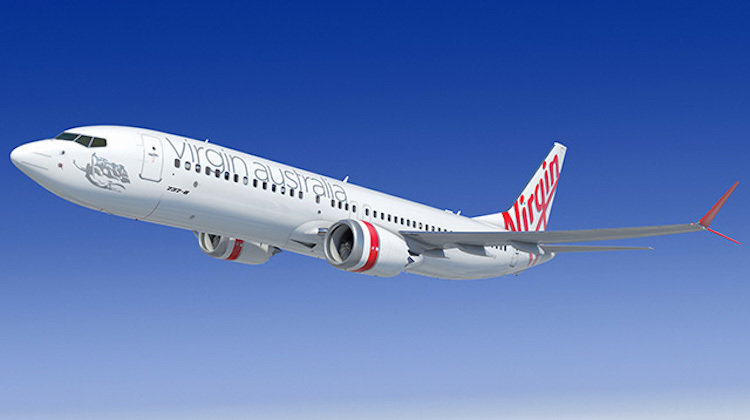 Virgin Australia has 40 Boeing 737 MAX narrowbodies on order, with the first delivery of the type due in the final quarter of the 2019 calendar year. And as far as the broader widebody fleet was concerned, Borghetti said in February the airline was in no hurry to place an order for new widebody aircraft, pointing to the relatively young age of its six Airbus A330-200s and five Boeing 777-300s. While the average age of its mainline fleet was 7.1 years at December 31 2017, up from 6.4 years 12 months earlier, it is a different story for the widebodies. As a result, the airline group has time on its hands to consider what would best meet its widebody needs. “As we talk about widebody replacements, and when we do it and what we replace them with, and I am talking about the 330s and the 777s, that’s really a long way away,” Borghetti told reporters during Virgin Australia’s first half results presentation. “Our average age of the A330s is about four and a half years or thereabouts. Our 777s are also a very young aircraft.